We are leading providing Army Canvas Tent to our customers. Size: 12 x 15 ; 15 x 18 ; 18 x 18 ; 20 x 20 sq. ft.
We are the high-flying manufacturers and supplier of a wide range of command post tent to our clients. Our ranges of these are fabricated using superior quality materials that are procured from reputed and certified vendors of the industry. These tents are useful for outdoor army camps and are easy to install and to pull down. ain, we are instrumental in offering an excellent quality range of Military Tent. 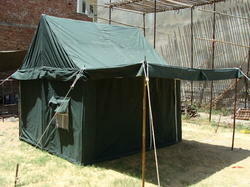 We are engaged in offering Army Tent, which is made of quality raw material to enhance the durability and reliability. 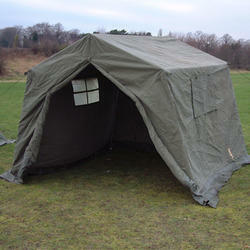 These army tents are useful for outdoor army camps and are easy to install and re-install. Moreover, our army tents are designed for temporary accommodation of military units for field work. Our Military Tent have the design and pattern of military. Our tent is absolutely defect free, qualitative, strong in structure and resistant to extreme weather. Its cost efficiency is its advantage. These are very easy to put up units, and 100’s of tents can be easily erected in a very short span of time, creating a tented colony. We have the privilege of supplying our Hospital Tents in Kargil and for many other army operations and Military regiments. We make tent as per requirement in cotton canvas cloth.